“Born of this luminous wisdom is a subliminal impression that prevents other impressions from arising.” (Yoga Sutras of Patanjali, Chapter I, verse 50). My yoga practice has enabled my transformation, allowing my uniqueness to gradually come to fruition. Through my practice, I have learned that yoga affects primarily my mind. I’ve come to learn that I am not the same person I was yesterday, or the same person before I began my yoga journey; a journey of discovery. With yoga, I continuously grow and learn every minute, every hour of the day. Each step I take, I embrace it wholeheartedly, and remind myself that the outcome will be enjoyable. Yoga shows me the way; it illuminates my path. My old barriers, which contained hidden fears, no longer have occupancy within me. Yoga reveals to me my most intimate secrets. It gives me a purpose of self-realization. It allows me to see the secret wonders of our universe and the individuality of people I encounter. Yoga has helped me understand that freedom, my constant desire, is found within my own mind, body, and soul, and not in some faraway foreign country. My yoga practice resembles my faith; I will always hold it dear to my heart and return to it. Yoga awakens my soul, just the way my faith speaks to my soul. The Niyama that I have embraced and continue to practice is ishvara pranidhana, which is self-surrender to the Divine. Yoga has ceased to be just a physical practice for me; it has also become a means to reach God. Yoga gives me a peaceful state of mind where I feel my connection to Him. I know that I have only touched the mere surface of this Niyama, but with my physical, meditative, and yoga text study, I hope one day that I may become one with the universe and God. The Yama that requires more of my attention is brahmacharya, which is knowing and carefully selecting the area that I wish to devote my energy to; it’s about setting boundaries. Through my yoga practice, I have learned to respect myself first, respect my space and my time. Through that realization, I have learned the true meaning of a boundary. I used to think that a boundary was a selfish act, but now I see that a boundary is self-preservation; a love towards oneself. My yoga practice allows me to find my inner peace. With my sustained practice, I hope to discover my authenticity. Through my yoga journey, I have been inspired to enjoy life and appreciate each breath I take. Namaste. I used to ask myself if Yoga would change me into someone more insightful or maybe help me become a better person. What I’m slowly beginning to learn is to give myself a break! I’m already a decent person. Yoga will continue to help me find my best inner and outer self and continue to evolve from there. Yama and Niyama are the first two of the eight limbs of Yoga. Yama to me means a behavior or attitude. The Yama that I’m doing my best to live by is Satya which means truthfulness. Sure, I’m honest I’m first generation Greek from New York, we’ve never had a problem being truthful. However, whose truth is it? And when do we offer it? When do we speak the truth? If I feel true compassion towards another person and what they are saying, I would want the truth to benefit them. There’s not only a time and a place to speak the truth, but also how we choose to address it. It’s important to learn more about that person and where they are coming from. The truth will be kinder and will have more clarity when we take the time to learn more about an individual. It’s easy to say too much. Then the truth becomes this unnecessary chatter and sounds in genuine. Ujjayi breathing helps me think and keep my focus. I believe practicing meditation frequently will help as well. Being truthful with myself doesn’t mean I have to be hard on myself all the time. During my corporate days (you know, wearing the high powered suit with the puffy shoulder pads.) I did well, but I didn’t believe in what I was doing at that time. I thought I had to be perfect. I found myself agreeing with people that I disagreed with. I thought if I would simply agree, this would help me succeed. Practicing Satya is helping me find my inner truth and hopefully articulate it more clearly. For me, this requires compassion, creativity and having an open mind. I’m learning to trust my intuition more. I threw wanting to be a perfectionist out the door. The rest will follow with practice. Since we’re speaking of truthfulness, life’s obstacles do get in the way. I want to avoid sarcasm (it’s negative and unkind) when I’m listening to someone and I’m thinking “are you kidding me?” I’m better off not saying anything at all at that particular time. I think this is where the saying a “there’s a time and a place” comes in. I also want to avoid raising my voice due to my annoyance with others at times. At this point, if ujjayi breathing is simply not happening, I think of someone who has had a positive influence on me. This person is Grandmother. She is the epitome of sincerity and truthfulness. She made me see truth. In my mind, I bring myself back to spending my summers in Greece with her in her village and her farm from when I was five years old until I turned twenty-four. I never missed a summer. She was quiet and I honestly believe it was because she was comfortable with herself. When she had something to say it would resonate with everyone (all 20 of us!) at the table. The memories we made and her quiet, yet strong influence on me stretches beyond my Grandmother’s village in Greece and into my world here today. She was poor, but she found a way to humbly share with everyone. We would watch the movies that came into town from her balcony (talk about good theater seats!) I can picture her looking over the crowd of people in front of her in Athens airport. The minute she would see my face upon arrival, her eyes would well up with tears and she pushed her way through to hug my brother and I. Our travels to Greece were made every year out of the love we have for our family. Love makes anything possible. The “union” in family as well as in yoga is filled with kindness, compassion, mindfulness and gentleness. I’m blessed to know what positive truth feels like. It’s always been within. I’m learning you have to find it, embrace it and keep on learning. When I began to think about writing this essay, I read all the different definitions and descriptions of the yamas and niyamas I could find. Truthfully, all of them spoke to me in one way or another. I felt that I could think and write about each of them without too much trouble. So I decided to pick the one that was most challenging to me. In other words, the one that would give me the most trouble. I chose Ishvarapranidhana, which I found variously defined as “surrender to the divine,” “devotion to God” and “celebration of the spiritual” in the different books I read. This is a very big concept to understand, for me at least. In attempting to understand what this means to me in my life I looked through the descriptions of Ishvarapranidhana in the same way I look over my kids’ math problems when I’m trying to help them with their homework. It’s all very difficult to penetrate so I’m looking for a lifeline, something that jumps out at me. All this talk about spirituality, the divine and (oh god) God is making me squirm. I have a lot of trouble with this. But all of the texts I read gave the same advice for approaching Ishvarapranidhana. Daily prayer or meditation is an opportunity to open yourself to the feeling that there is a greater intelligence at work in your life. And this is wonderful news to me because I am trying to develop a meditation practice. It was a revelation to read that meditation could give you a connection to something larger than yourself. I started meditating in order to connect with my inner world and to understand myself. I was hoping that meditation would give me the ability to see beyond the surface of my thoughts and actions. And hopefully give me the ability to really listen to others, live in the moment and pause before I act. And meditation does that to certain extent. It is a mystery to me why it works, but it does. The days that I meditate seem slower and softer. I don’t know how else to describe it. I feel quieter and more patient. After studying Ishvarapranidhana a little for this essay, I can see where I need to try and dig deeper. It is difficult for me to accept that I am not the guiding force in my own life. Surrender is very hard for someone like me. I live by my schedules, all neatness and order in my world. If everything is in it’s place I am in control of my life. The definition of Ishvarapranidhana that really resonated with me was in the book “Yoga Mind, Body & Spirit” by Donna Farhi. She says that setting aside time for meditation every day allows us to see past our own cluttered thoughts and realize the divine intelligence that is there in the form of intuition. Ishvarapranidhana asks us to recognize that there is a bigger picture than our daily drama and our resistance to change. It asks us “to go quietly, even when it’s not possible to see exactly where things are headed.” Sweet surrender, and easier said than done. schedule find a class and join the fun! new to yoga? learn about your first class! Welcome to Inner Power Yoga! We are an award winning yoga studio that offers daily power yoga classes for all levels from beginner to advanced. 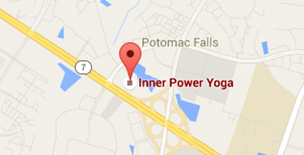 Come practice with our wonderful yoga community at our beautiful studio in Sterling, Virginia.